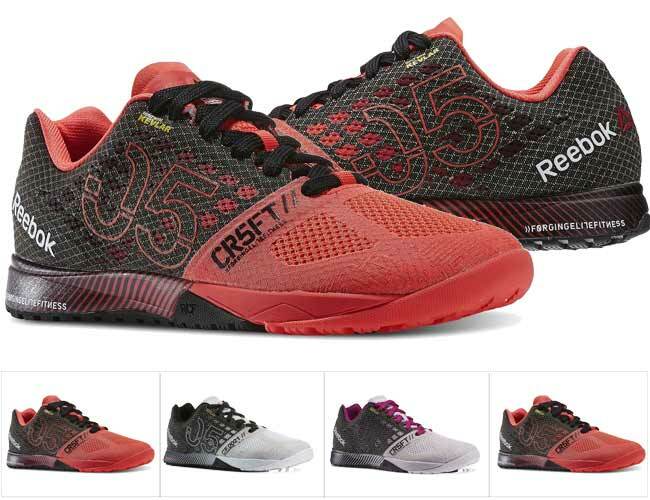 This innovative and ultra-light training shoe from Reebok features the latest soft and supportive nano shell midsole, and a very durable and comfortable Kevlar mesh upper which offers excellent breathability and durability. These training shoes are so lightweight that you will have the feeling that you are flying and still will give you a more secure feeling when lunging, squatting and jumping. This combination of great features, as well as the contoured heel counter and raised patterns on the outsole makes the nano 7.0 perfect for better and safer performance of all the types of exercises included in intensive cross-fit training sessions. This minimalist trainer has sufficient toe space to allow the toes to spread comfortably for added stability and balance when lifting weights. The excellent heel support will help you keep going and protect your feet and ankles during the strenuous exercises. The tongue is sewn in, so that it doesn’t slip during training. They are a bit high and could cause a bit of rubbing on the ankles, but with some heavier socks you should be able to avoid that and enjoy the stability they offer. This shoe offers serious arch support which may take some getting used to at first, especially if you are not used to wearing minimalist training shoes. They innovative Kevlar mesh upper support keeps the foot nicely fitted and holds it stable and in place, and yet offers excellent breathability to keep your feet dry and fresh even after intensive exercising. Although they are definitely not suitable for running shoes, these trainers are great for ladies who enjoy cross-fit, weight lifting, interval training or any other indoor workout. Overall, these cute training shoes are light, have sufficient toe space, and offer excellent support. They have great breathability and will help keep your heels nice and dry even after serious training. Given all these features, they can help improve the balance of the body during weight lifting, cross-fit exercises or any intensive indoor training. We definitely recommend them as excellent shoes for cross-fit for ladies.